OMG! The dive instructors were awesome! This is a bucket list item for sure! Excellent instructor to participant ratio and attention while doing the dive. Excellent instruction for the Discover Scuba program. Excellent instruction for the Discover Scuba program. Felt safe with the dive master. Water was warm and clear. Saw a variety of fish and coral. Great excursion instructor was great and very patient. seemed shorter than others we&apos;ve been on. 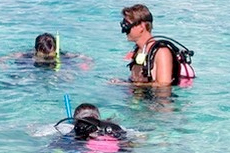 I have had four scuba lessons in a pool, but always wanted to scuba in open water. We did the Discover Scuba Diving excursion with Underwater Safari. Was a great time, Mike the captain and Max the diving instructor, were great. Was a great time, Mike the captain and Max the diving instructor, were great. water was so clear and both dives were amazing. I&apos;m certified but I went with my kids on the discover scuba diving tour. Loved every minute of it...the guides were very patient and helpful. We loved scuba diving with Coki Dive Center. We loved scuba diving with Coki Dive Center. They were fantastic! We had never been before and they gave us a quick lesson beforehand before gearing us up and getting us in the water. Would definitely go scuba diving again! The instructor was very effective. The instructor was very effective. Equipment was good. The only problem was the water was very murky and underwater visibility was not good due to storms on the east coast. All in all it was a good excursion. they took us to buck Island to dive a small reef and ship wreck. My husband went scuba diving for the very first time and loved it. My husband went scuba diving for the very first time and loved it. The emphasis was on safety. All equipment and instruction were provided. The cost was $109. My husband had a terrific time. We went to Coki Beach to learn PADI (scuba) diving - it was fabulous. As for the SCUBA diving, it was very fantastic!!!! They got my son certified with the beginner PADI Scuba Diver in only 1 day. They got my son certified with the beginner PADI Scuba Diver in only 1 day. Really terrific service. My son did this and loved it! Coki Beach Dive Centre was incredible! I took my first scuba-dive, and it was a fairly good experience. I had been told that St.